What is the optimal content length? 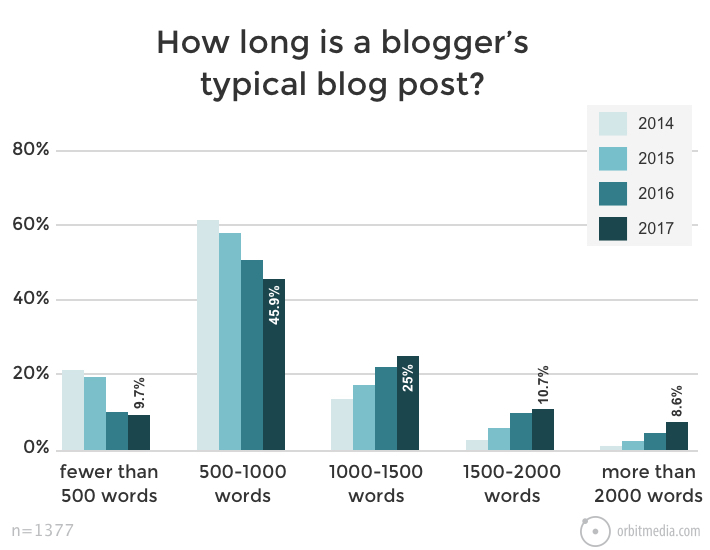 How long should your blog posts be? What is the ideal word count for SEO? These are questions many would-be bloggers and marketers ask themselves. Obviously many things go into successful content marketing. From choosing the right keywords, to learning to write well, to image optimization. All these are factors in the success of your content. However, content length remains a critical topic, not least because it determines a lot about your overall strategy. Should you write a lot of shorter articles or concentrate on pushing out one massive article per month? Or is the truth somewhere in between? As you can guess, there are a lot of opinions about this out there. 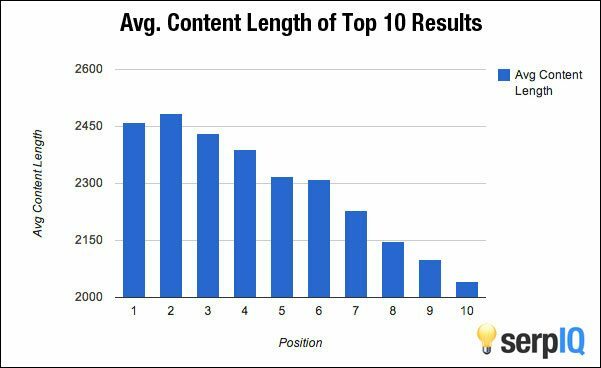 To shine a light on this topic, in this article we will examine the available research on ideal content length. You will learn the findings of the biggest studies out there and the conclusions they have come to. The goal is to enable you to make decisions about your own content strategy and tweak it to make your content more successful. Below you will find the synopsis of the most significant pieces of research on optimal content length. Let’s summarize their findings to give you an overview. After that, we can put together the conclusions to draw from this. The longer the content, the more shares it gets. Posts in the 3,000 to 10,000-word area performed exceptionally well. 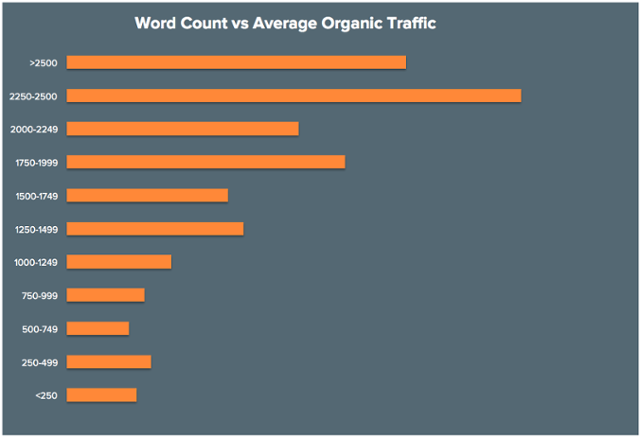 There were 16 times more blog posts with a word count below 1,000 than content that has more than 2,000 words. Consequently, if you want a chance for your articles to go viral, aim for at least 2,000 words per post. Long-form content ranks significantly better than short-form articles. How long is long-form content? Well, the average word count of results on Google’s front page is 1,890 words. There are also some other important findings such as the effect of page loading speed, images in posts, usage of HTTPS and more. I recommend taking a look. 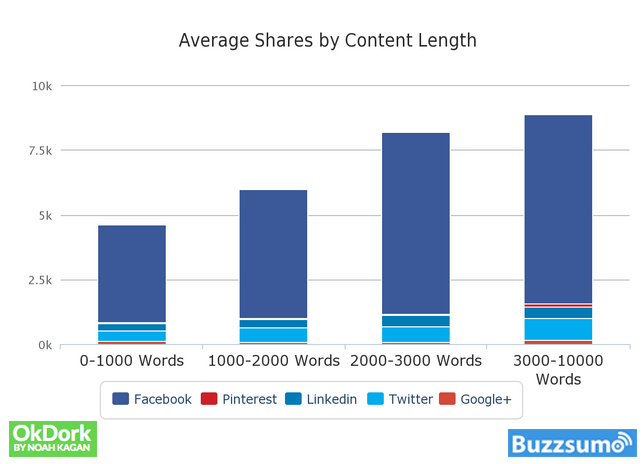 Long-form content (over 1,000 words) consistently receives more shares and links than shorter posts. This is especially true for research-backed and opinion-forming pieces. Over 85 percent of online content is less than 1,000 words long. Consequently, if you can surpass that, your chances of performing well in social networks and search engines increase. However, the effects start to wear off past 2,000 words. The perfect blog post takes seven minutes to read. After that, reader engagement starts to decline. According to Buffer, this translates to about 1600 words, less if you include a lot of visuals. The pages on results for long-tail search queries (meaning more than two words) contain on average almost 20 percent more content than for shorter queries. That means for broader topics users do not expect long posts. However, if your topic is more narrow, you should provide more in-depth coverage. At the same time, content quality and relevance play a crucial role in page rankings. Solely creating content of a certain length doesn’t help if it’s irrelevant to the user’s query. 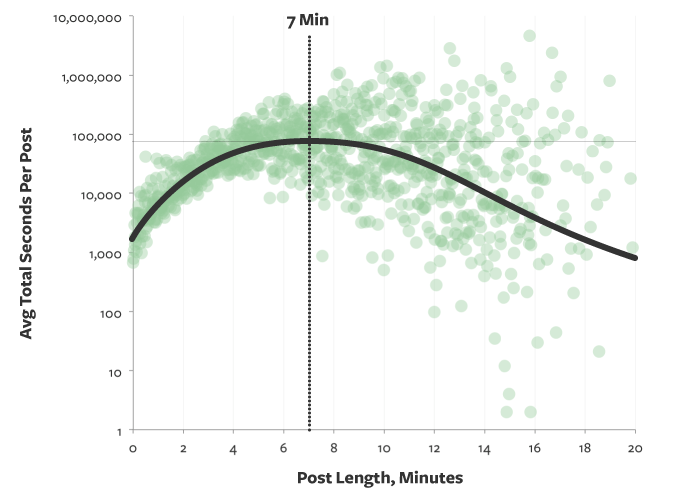 In 2012 SerpIQ conducted a study to determine the optimal length of blog posts. For that, they examined the average content length on every rank of the first page of Google for more than 20,000 keywords. Unfortunately, the study itself is no longer online, however, it’s findings are. They showed that the average number of words for content in the first place of Google was 2,416 words. On the other hand, articles ranking in tenth place were on average only 2,032 words long. However, it’s important to note that the data in this study included text in sidebars as well, so you can reduce the numbers a bit. The posts that were shared the most and have a top-3 Google ranking are on average 4,066 words long. The minimum word count is 2000+. However, length alone is not decisive, quality and relevance matter as well, especially for social shares. Content length definitely matters and longer content performs better if it goes hand in hand with great quality. A blog post should contain at least 300 words in order to rank (that’s also the advice they give in the content checker of their plugin). 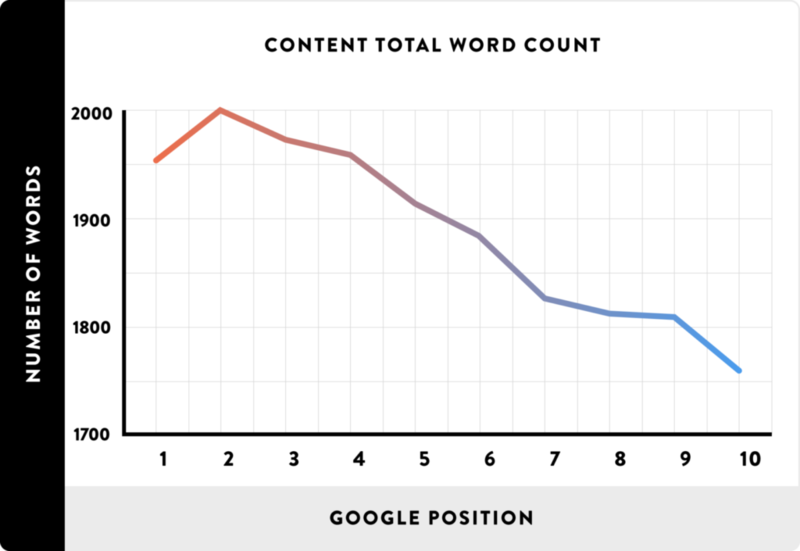 Longer blog posts of 1,000+ words have a higher chance of ranking well. More content means Google can better understand what your post is about, helping it move up in the search rankings. However, you need the writing skills to sustain longer blog posts and make them valuable. Otherwise, they might scare off your audience rather than draw them in. For that reason, you need to also make your blog posts readable. If you are not the best writer, maybe aim for 700-800 words instead. An article by Buzzsumo offered another interesting perspective from the realm of online journalism. Many news outlets have adopted a successful content strategy that includes simply posting more (short) content. Of course, you need the labor force to make this happen. The average blog post is now 1142 words long, 41 percent more than three years earlier. Half as many bloggers write content with less than 500 words. 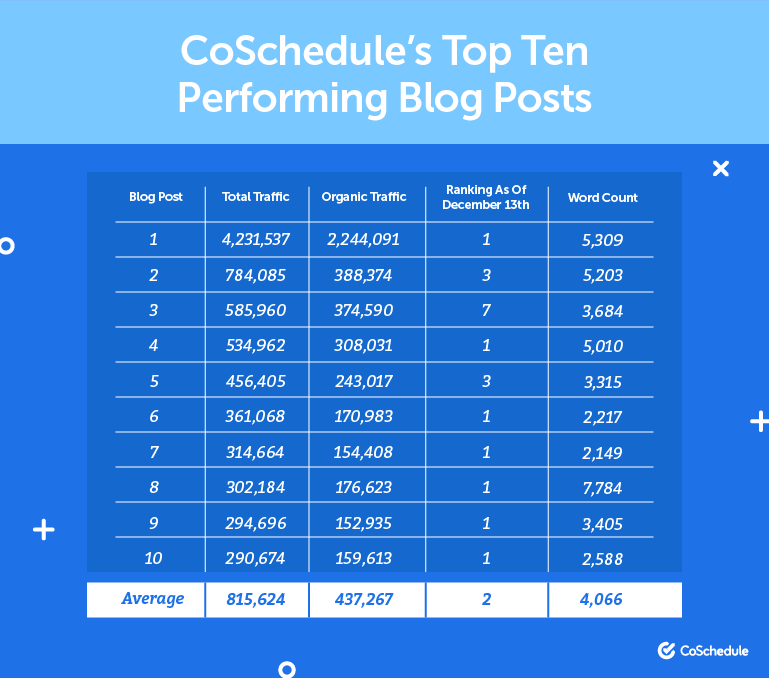 In contrast to that, the number of bloggers writing 2000+ word posts has increased sixfold. They also report better ROI from longer content. Going through the above, you have probably already identified some patterns. Let’s summarize the key findings. One verdict is pretty clear: if your goal is to rank well, get links and social shares, long-form content is the way to go. In pretty much all studies, it greatly outperformed shorter pieces in these areas. However, what exactly constitutes long-form content is not set in stone. The studies agree that it should be at least a thousand words, however, it’s probably better to shoot for 1,500-2,500 or even above that. Yet, these numbers also differ by industry and should only be seen as guidelines. In reality, you need to adjust your content length to your particular area, the competition and topic you are covering. However, shorter posts should not be completely dismissed. They can also be a viable part of your content strategy, especially if you can produce a lot of them. They can get decent mileage on social networks, however, their SEO value is generally relatively low. There are exceptions for some industries. Again, it’s important what you are writing about. While there is an obvious correlation between content length and content success, other factors also matter. Most of the articles and studies above stress the importance of focusing on quality first. That’s something we have also repeatedly stressed, for example, here. It means investing in readability, a good structure, layout, and visual aids like images. Also, make sure your pages load fast and that your site is optimized for mobile. Most of all, however, focus on relevancy. High-quality content means, when somebody clicks on your link in the search results or on a social network, they get what they came for. This also determines much of your content length. After all, blowing up a topic that you can cover in 200 words to 2,000 won’t increase the value for your audience. On the other hand, don’t shortchange yourself either just to fit into an artificially defined range. If your goal is to create an uber-useful resource that takes 4,000+ words to cover, by all means, go for it. If it’s worth it, your audience will appreciate it. So, Is There Such a Thing as Ideal Content Length? The question of how long a blog post should be is very central to blogging and content marketing. After all, creating content is an investment and it’s only natural to want a return on it. Looking at the available research in this area, it’s clear that long-form content tends to perform better. That is no wonder, as the average content length has only been increasing over the past years. Therefore, content creators who want to play in the big leagues need to keep up with the competition. However, short-form content also has its merits and can be part of your content strategy. In the end, your topic needs to determine how long your content is going to be. Just concentrate on creating the best blog posts you can and let it develop naturally from there. What’s your experience with content length? How do you handle this topic in your content strategy? Let us know in the comments section below.